The sun is shining and Pen-clawdd looks more picturesque than I remembered it. I set off heading eastwards towards Gowerton, following a well-paved cycle/walkway alongside the coast road, and making rapid progress. To my left is an expanse of flat marsh and the distant bridge that will take me over the River Loughor and towards Llanelli. A little later, according to my map, the Wales Coast Path veers off to the right and ambles across the top of a low ridge of hills just inland of the road. I stop and think about this. The route over the hills looks attractive and would give good views over the estuary. But the walk/cycle path continues alongside the road and keeps me closer to the water. Do I follow the route of the Wales Coast Path? It seems perfectly safe, legal and reasonable to continue on the coast road, so that is what I do. Of course I worry about my decision. Perhaps the path will come to an end and I will be forced to dodge traffic and walk in the road? A little further along and I see a footpath sign off to the left. This cuts across a couple of fields in the marsh, taking me even closer to the estuary and shortcutting some road walking. But, after I cross the first field, I find the footpath is horribly overgrown and the next gate is fastened shut. I could climb over it – but there is a forest of nettles on the other side. Defeated, I return to the road. The paved cycle-path leads me safely to the outskirts of Gowerton, where the meandering Wales Coast Path re-joins my route. And we both turn left along a minor road towards Loughor. The minor road has no separate pavement, so I’m forced to walk in the road. Further on there is a narrow cycle lane, marked off with white lines on the road. Traffic is light, but it’s not ideal. The road takes me down to a small bridge. Here I stop for a photograph. Across the marsh is Pen-clawdd, and I can see the distant hump of Llanmadoc Hill. Suddenly I realise I’m leaving Gower behind. Over the bridge and the Wales Coast Path veers inland once more. (I’m beginning to realise the ‘Coast’ part of the name is a flexible concept!) But my quiet road, with its cycle lanes, continues straight ahead and so I decide to stick to the road. Eventually the road passes under bridges, under the railway line and the A484, taking me into Loughor and here I rejoin the official path once again. I walk past a recreation field and can’t resist climbing up a mound to look at Loughor Castle. It’s a ruined Norman castle built on top of an old Roman fort. It would have commanded the estuary and have been a great strategic position. Near the castle is a church – St Michael’s. It’s perched on top of a hill and surrounded by trees, so I am unable to get a decent photograph of the building, but there are amazing views from the little churchyard. Standing at the far end, I look over the gardens of houses beneath, over the estuary, and a clear view of Llanmadoc Hill. The graves are an interesting mix of old and new. One headstone caught my eye. 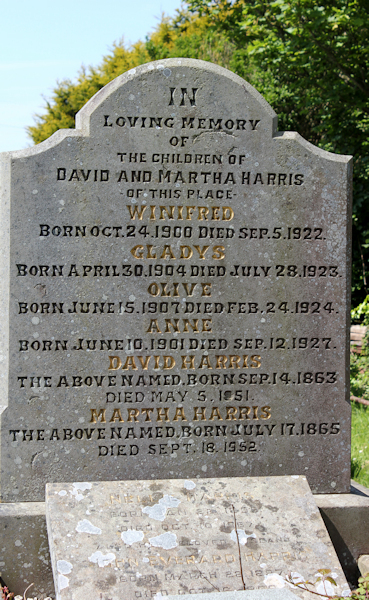 David and Martha Harris both lived to the good old age of 87. But as a young couple and over the course of 5 years between 1922 and 1927, they buried 4 daughters. How sad. And what did the girls die from? They weren’t children, but young women. Winifred (aged 21), Gladys (19), Olive (16) and Anne (26). Their names are evocative of the age. There is a mystery here. Maybe one day I’ll research it. On a happier note, the final stone, added later at the bottom of the main memorial, is to Nellie Harris who lived to be 68. At first I thought that meant at least one daughter survived, but then I take a closer look. Here is Nellie’s husband too, John Everard Harris. So Nellie wasn’t a daughter to David and Martha, she was a daughter-in-law. But at least they had a son (John) who survived them. Leaving the churchyard, I walk down towards the Loughor Bridge. This is a busy road bridge, with a rail bridge running alongside it and just hidden from view in the photo below. Over the bridge, and the Wales Coast Path leads off to the right. This time I don’t hesitate about following it. The main road is the busy A484 – far too unpleasant and dangerous to continue walking alongside. 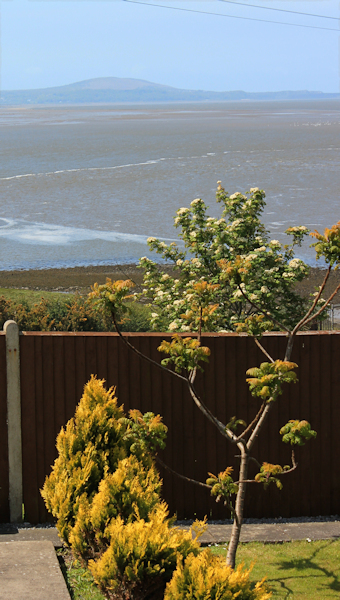 … and down towards the bank of the estuary. This part of the walk is only marred by a cloud of thick black smoke. Someone is burning something toxic. Tyres maybe? The smoke smells foul. I follow a track along the water’s edge. Spring flowers. Lovely. But I’m getting hungry. It’s 1pm. Time for lunch. My map shows a PH off to right. I wonder if I can get to it through the caravan park? And then I notice the security cameras. Instantly I become paranoid, convinced the park’s security men are tracking my movements and watching this strange woman trying to break into their clubhouse. Expecting to be challenged at any moment, and trying to look casual, I trot – as quickly as I can without actually running – back through the park and towards the river. Anyway, by now I’m both tired and hungry. I find an isolated spot and sit on a wall overlooking the estuary. It’s a great spot for a snack. I pull out my apple, emergency chocolate bar and water bottle. This entry was posted in 12 South Wales and tagged hiking, photography, pubs, travel. Bookmark the permalink. Ooh, thank you Peter. Nice to read more about him and well done for discovering this. “I’m beginning to realise the ‘Coast’ part of the name is a flexible concept!” I love this statement on your blog lol Wait until you get to Barmouth, Camarthen, Pwilheli to name a few, it started to drive me made following the signs. “I bet you will never guess what happened next…” How about a seagull stole your chocolate? It involves an animal, but not a bird 🙂 Will get the next instalment up tomorrow! Ooh a cliffhanger to end! And don’t be downhearted about leaving Gower. You’ll soon reach Pembrokeshire! A National Park and the bits of the coast I’ve seen are gorgeous. You’ve got Carmarthenshire first though and sadly quite a bit of the coast path is not very coastal there either. Pembrey Forest being particularly odd. There is a lovely beach, but the coast path twists and turns through woodland inland instead. I gave up with quite a few bits of the coast path there and found my own route. Usually (but not always) successfully. I shall be interested to read if you get lost in the same places I did. We had a mare and foal try to root through our bags when we stopped for lunch in north Kent. And years ago a locally famous “friendly sheep” tried to eat a Mars Bar of mine in the Lake District (I got a stern talking to from a YHA volunteer when I tried to push the sheep away after it just wouldn’t leave me alone). But neither of those occasions were really rude of bizarre (save for the YHA volunteer who was a bit of both). I’m looking forward to tuning in for tomorrow’s episode! We used to keep sheep. When the children were young, if they wandered into the field eating biscuits, the sheep would knock them over and steal the food from their hands. They’re not as stupid as they make out (the sheep, I mean, not the children). So many closed pubs! Graveyards always seem full of stories to me and get my imagination going. That’s very sad that David and Martha lost four daughters. Did you ever research and find any answers? Yes very sad. No, I’m afraid I didn’t do any research. There is a tragic story here, I’m sure.